I like to think of myself as a comics generalist, in that I know a bit about all aspects of comics. I like to be able to have discussions and talk intelligently on anything from artistic styles of WWII comics to running a comic shop to the history of manga to periodical distribution in Europe to whether Spider-Man is cooler than Deadpool. I don't claim to be an expert in any of those specific niches, but I can at least keep up with the conversation. It also means that there's a nearly infinite amount of material out there for me yet to consume. Lately, I've been trying to catch up to speed with French comics, which is a bit tricky since I don't speak the language. Fortunately, a number of the better works have been translated and are filtering over here in the US. 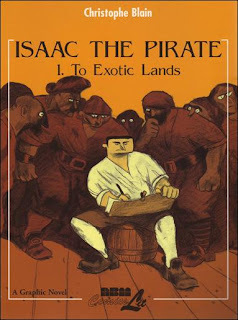 Which leads me to picking up Christophe Blain's Isaac the Pirate from NBM. The story is about a young, struggling painter in the 18th century. While trying to make his own way, having had a falling out with his father, he's "coerced" into joining a pirate crew. The pirates aren't nearly as blood-thirsty as those of movies and legends, and Isaac is generally treated well, removed from much of their more villainous behavior. All but Isaac and one other member of the crew are killed, and the two fight and steal their way back to Isaac's hometown. He finds his fiancée has left with another man and all of his old friends have also moved on. The two manage to squeeze out a reasonable living through theft, and Isaac's experiences now seem to deny him the ability to return to his former social class. I think one of the best things about this story is its depictions of naval life, and its impact on those family members who are left behind. The life is dangerous, but generally not in the swashbuckling way many people think of. I also quite like that both Isaac's actions and inactions have consequences, and his decisions follow him to varying degrees. The art is, despite some cartoonish appearances at first, almost surprisingly rough. Especially as the story continues and Isaac's life becomes less refined. Blain's inking seems to reflect the tone of the story as it moves from "cultured society" to its dregs. The color palette also tends to be reflective of the tone, with brighter colors being used for "brighter" social interactions. I rather enjoyed the two books out so far. My understanding is that Blain has completed the story, but it has yet to be translated and printed here in the states. I don't know if NBM has that on their schedule or not, but it does leave the chapter I read feeling a little bit at a loose end. But the story and the flow worked well, and seemed quite natural despite some somewhat unnatural character designs. Also, I don't usually mention the actual production, but the binding on my first book here didn't hold up through a first reading. The groups of stitched pages are okay, but the glue holding all of them to the spine was falling apart as I turned the pages. I don't know if that was a one-off, or something endemic of that entire run. My copy of the second book was fine. So maybe just something to keep your eye out for. If you like or are familiar with Blain's contemporaries like Émile Bravo, Lewis Trondheim and Joann Sfar, this falls in a similar vein and would be worth picking up. Y'know, hooray for this blog. Because too often, I'm reading stuff about comics and everything just seems such completely ridiculous crap that for a moment, I almost think "comics are the worst thing in the world." There cannot be too many antidotes for this, or if there can, I don't think we're there yet. Keep at it.